Back in November of 2015, Google expanded its Local Guides program with a points and level system that introduced new rewards for each tier. At 200 points, you would reach the coveted Level 4 and receive 1TB of free Google Drive storage for 2 years. Now Google is backing away from that promise and lowering the amount of free storage to 100GB only. 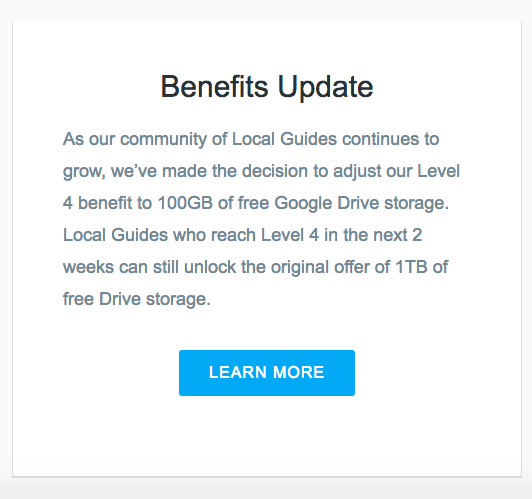 As the corresponding Local Guides support document states, those who are already signed up to the program have until July 21 2016 to reach Level 4 and redeem their free 1TB Drive storage. After that date, or for those who aren't Local Guides yet, the free storage will go down to 100GB. Excuse me while I scramble to post all the photos and reviews that I've been putting off for months... and try to understand why of my 97 (mostly detailed) reviews, Local Guides is only counting 12. What the hell, Google? !